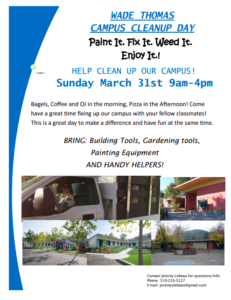 Wade Thomas Campus Cleanup Day is this Sunday, March 31 from 9am-4pm. This day is so important to keeping our campus looking good and functional because there are so many things that the district requires we do on our own! Come make a difference at your own school. We have so many exciting jobs for everyone to do including painting, fixing gates, backstops, sheds, and weeding. You can feel free to drop by for as long or as little as you would like. PLUS: Breakfast and lunch is provided! Coffee, OJ, and Bagels in the morning, PIZZA served in the afternoon!